An increasing number of CORYS’ 700 transport simulators either directly include or have been upgraded to include modelling of Communication Based Train Control (CBTC) systems. This technology is now becoming widespread – and in many cases mandatory – in Europe (ERTMS) and the US (PTC). Here are the examples of four countries : USA, Italy, Switzerland and Austria. Business Development Manager CORYS Thunder Inc.
Federal authorities in the US have made Positive Train Control (PTC) mandatory in the wake of the Chatsworth rail disaster, in which 26 people died in 2008. Was PTC under discussion in the US before the Chatsworth disaster? There had been a growing interest since the 1990s, but the accident really brought it to the top of the agenda. The train ran a red signal while the driver was sending a text message. He simply failed to see the signal, and the train collided with a freight train travelling in the opposite direction. If his train had been fitted with PTC, the train would have come to a halt automatically. What’s in the Railway Safety Improvement Act, passed following the accident? It makes PTC mandatory for all Class I freight companies, as well as for all passenger operators, now by 2018. How have your clients responded to this uncertainty? 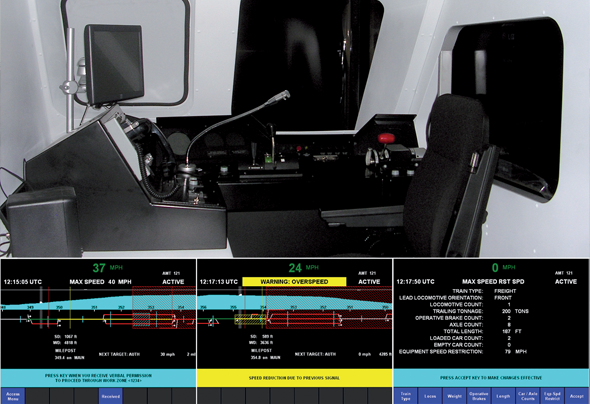 BNSF, Union Pacific, Amtrak, Metra and Metrolik have ordered upgrades for one hundred or so simulators in the space of a few years, for various versions of PTC.. Many new clients have ordered simulators from CORYS to specifically train PTC. You validated the ERTMS simulation model that CORYS developed for Login. What have you learned from this experience? Firstly, that it takes time! Validation in Grenoble lasted one week, using the same validation processes as on the real-life line (NBS Mattstetten-Rothrist). Secondly, the simulation model must be validated by someone who has current and former real-life experience of the ERTMS Level 2 system. If you work solely on the basis of the theoretical documentation, you end up designing a module that does not respond in the same way as the actual system itself. How many drivers has Login trained to use ERTMS Level 2 since 2010? We have trained some 200 beginners as part of their general training during the course of a two-day module, some of which took place on a simulator. The exam comprises written, oral and practical sections, and took place after the general theory test had been completed. Do you also do refresher courses for active drivers? We have catered for 500 drivers from CFF (Swiss National Railways) and a further 200 from BLS (Bern Lötschberg Simplon), for a half-day simulator training module. In this case the aim was different: we needed to devise incidents, because in real life, ERTMS works almost too well: drivers are rarely confronted with unexpected circumstances. Many drivers realised that previously, they had not really understood ERTMS fully. That said, I always recommend ending the course with scenarios in which everything works normally, so as not to throw the participants too much! * Paolo Induni has since joined the Swiss National Transport Office, but was responding to our questions in his former capacity as expert and trainer for Login’s professional training arm. Swiss training firm Login is more than ready for the advent of ERTMS Level 2: CORYS completed upgrading work on some thirty simulators for the organisation in January 2010. Six months later, the Swiss Transport Agency (OFT) granted Login a two-year authorisation to train and certify drivers using simulators. This authorisation has then been renewed for a longer period. There has been very positive feedback from the first two years’ worth of experience. In particular, commissioning of ERTMS has opened up all sorts of new possibilities with regard to rail traffic management – and is even having an impact on drivers’ job specifications. One striking example of this concerns the Lötschberg tunnel, fully 35km long. If a serious incident requires immediate evacuation, trains will now be able to reverse blind at 80km/h! This so-called Reversing mode, allowed by ERTMS Level 2, is so far removed from drivers’ safety-oriented culture that it had to be practised on simulators – not without some difficulty. ERTMS Level 2 entered service in Austria on January 1st 2013, with the commissioning of the high-speed line between St Pölten and Vienna, a distance of 60km. Right from the outset, ÖBB’s Infrastructures division decided to use one of its CORYS simulators to help with engineering design work, looking at questions such as where beacons should be located, the right automatic braking settings for each situation, traffic optimization and so on. This is simple enough for straight sections of track in the open countryside. However, it is much more complicated at points and station approaches, where the new line runs side by side with other, non-equipped track. “We used between 60 and 80 validation scenarios for each new line,” explains Thomas Denis, one of CORYS’ Account Managers.